Multiple media reported the FBI had an informant spying on the presidential campaign of then-candidate Donald Trump. The Justice Department refused to reveal the source’s identity to congressional oversight leaders, saying divulging it could put people’s lives at risk. But multiple legacy media outlets claim to have learned his identity and have described the person and his activities in such detail as to make his identification all but certain. Details about the spy became the target of two articles, one by The New York Times, one by The Washington Post, both published on Friday, May 18. While neither article named the spy, citing concerns for his safety, their descriptions are so specific they overwhelmingly imply a single conclusion, when put in context to other reporting on the subject. While it’s unlikely Papadopoulos was contacted in the same month by scores of intelligence-linked, Republican administration-serving American academics offering $3,000 and a London trip for a Mediterranean gas field paper, the Daily Beast article offers one important fact—the man’s name is Stefan Halper. The spy seems to be connected to the FBI’s official rationale for starting an investigation into the ties between officials from the Trump campaign and Russia. “The professor’s interactions with Trump advisers began a few weeks before the opening of the investigation,” the Washington Post article says. Trump alleges political motives behind the investigation. “If the FBI or DOJ was infiltrating a campaign for the benefit of another campaign, that is a really big deal. Only the release or review of documents that the House Intelligence Committee (also, Senate Judiciary) is asking for can give the conclusive answers. Drain the Swamp!” he said on Twitter on Saturday, May 19. An unofficial explanation for the start of the probe was leaked by anonymous American officials to the New York Times for an article published on Dec. 30 last year. The newspaper reported that Australians had passed intelligence to the FBI in July 2016 about a drunken conversation between Trump campaign adviser George Papadopoulos and the top Australian diplomat in Britain, Alexander Downer. But no Australian or American official has confirmed the Times reports on record. 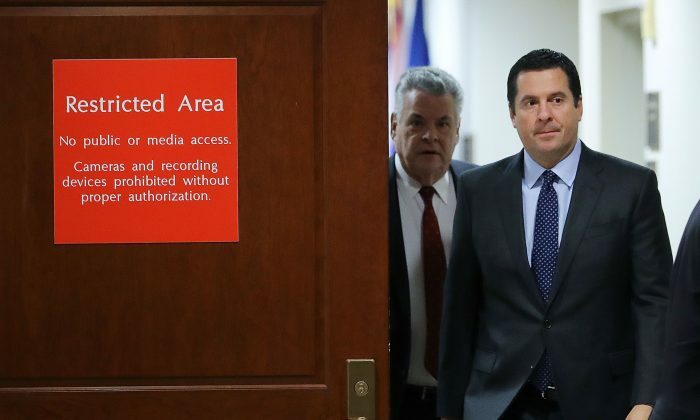 Chairman of House Intelligence Committee Devin Nunes found that the FBI did not put forth any electronic communication records between Australian intelligence agencies and their American counterparts to substantiate its investigation. This has led Nunes to dig for the ultimate reason for the start of the Russia probe. The Justice Department (DOJ) stonewalled Nunes’ attempts at oversight even under the threat of contempt charges and impeachment. The substance of Nunes’ request dealt with a top-secret intelligence source—a specific individual, DOJ argued. “Disclosure of responsive information to such requests can risk severe consequences, including potential loss of human lives, damage to relationships with valued international partners, compromise of ongoing criminal investigations, and interference with intelligence activities,” stated a May 3 letter to Nunes from Assistant Attorney General Stephen Boyd. The department finally relented during a meeting last week and agreed to discuss the matter at a later date. According to court documents, Papadopoulos spoke to a person in Britain who claimed to have connections to the Russian government. The New York Times revealed that the person is London-based Maltese professor Joseph Mifsud. Mifsud told Papadopoulos in April 2016 about Russians having “dirt” on Hillary Clinton, including thousands of emails. Weeks later Papadopoulos told the story to Downer. How intelligence about that conversation made its way to the FBI is still unclear. The truth could be revealed in the Department of Justice Office of Inspector General’s report expected to be released this month. The persecution remains arguably the most severe human rights issue in China today.